The primary goal in a Product Owner role is to represent the customer to the development team. A key activity is to manage and make visible the product backlog, or the prioritized list of requirements for future product development. In fact, the Product Owner is the only person who can change the order of items in the product backlog. One unusual aspect of Product Owner responsibilities is that you must be available to the development team at all times to answer any questions team members have regarding the customer’s view of how they’re implementing a product feature. Business Analyst: While the role of Business Analyst varies widely from company to company, in the Product Management arena, it usually aligns most closely with the role of Product Owner. Watch out for the following ‘gotchas’ to in order to succeed in a Product Owner role. A Product Owner shouldn’t be a Scrum Master. These are separate roles and need to be separate people to make sure that responsibilities are not muddled. In many teams the Product Manager also fills the Product Owner role. This situation leads to a crushing workload and difficult-to-manage expectations because Product Managers should be spending a fair amount of time understanding customers’ needs by stepping outside of the office. The need to be in the office as a Product Owner— and yet still have a deep understanding of customers — is a conflict that continues to create great difficulty for approximately 70% of Product Managers and Product Owners in Agile development organizations. Product Owners are placed in the engineering organization while their Product Manager is part of Marketing or Product Management. Trying to please two different departments can create conflict between the two roles. The solution? Move Product Owners out of the engineering department so that the customer value is agreed before its presented to developers. Domain expertise: Very often, your knowledge of the product and the market it serves is why your company hired you. The fact that you know the customers and how they use your product is the main reason you’re now a Product Owner. Maximizing Product Value: There are only so many hours until your product is released to customers. The Product Owner focuses on what is most important to deliver next. A ruthless focus on what should be next balancing technical constraints and a differentiated product which will make your customer’s eyes shine is the hallmark of an amazing Product Owner. Communication and Influencing Skills: One of you works with many others developing the product. Their focus is on the technical aspects of the problem. Your job is to listen carefully and make sure they are on board with the next hurdle in getting your product to market. Dig deep and learn as many influencing skills as possible to make your next product great. 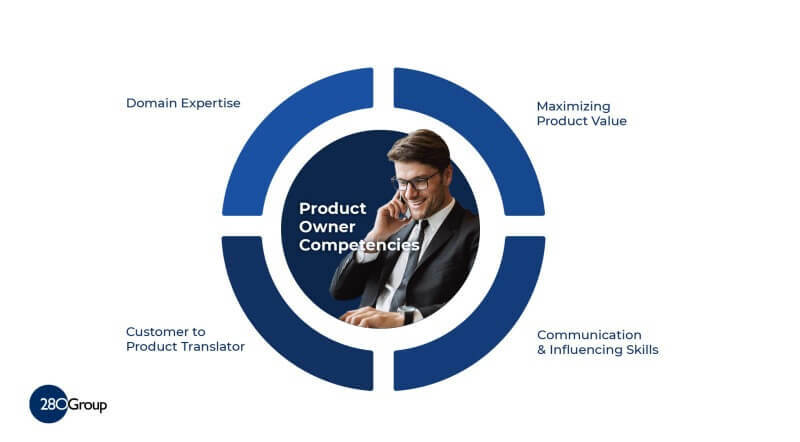 Customer to Product Translator: The Product Owner role lives in the gap between what customers want (or even think they want) and delivery of the tangible product features. You translate customer language into technical details using every trick in the book. Whether it’s pencil sketches or intricate technical details or even painting a picture of the customer for your developers, you are make the difference between an OK product and one that customer’s love. Ensures user stories are “ready” for development to start work. Ensures each story has the correct acceptance criteria. Gathers, manages, and prioritizes the product backlog. Ensures close collaboration with the development team. Works closely with engineering and quality assurance to ensure the right customer problem is solved. This can involve sharing market research and competitive analysis with the team to best focus their efforts. Has technical product knowledge or specific domain expertise. Contributes to the work of the Product Manager as they define a product differentiation strategy. Tracks progress towards the release of a product. Create the product vision and roadmap which accomplishes the goal of the vision. Develops positioning for the product. Work with a cross-functional team in planning a product release. Develops personas either alone or in conjunction with a team including user experience experts. Define customer needs and the associated features to meet those needs. Advocates on behalf of the customer for the development team. Prioritizes defect or bug resolution. 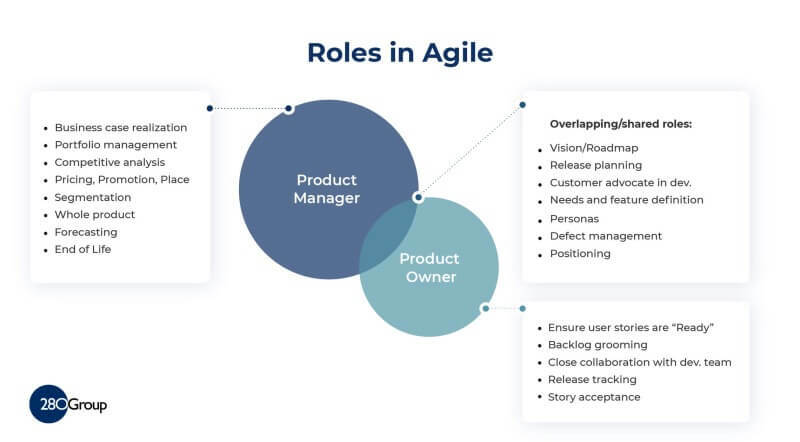 If you also have Product Management responsibilities, check the list above and look at the image to determine how your actual role lines up. Is there any task that isn’t currently assigned to someone? Product Owners maximize value through careful selection of what developers work on next. Here is a list of the most comment documents or deliverables that you may be asked to create and manage. Be aware that each company has their own specific list and terminology. While the list of deliverables is short, Product Owners create many, many user stories as part of their work. What’s the difference between Product Manager and the Product Owner roles? The key difference between a Product Manager and a Product Owner revolves around their mindset when approaching a problem to be solved. Look in the Agile section for further information on how Agile and Scrum work. Product Owners call on a range of influencing and technical skills. Here is a list of what managers look for when filling a Product Owner role. Demonstrated success in releasing products that meet and exceed business objectives. Excellent detailed written and verbal communication skills, possibly including some user interface documentation skills. Subject matter expertise in the particular product or market and how to develop solutions for this market. Subject matter expertise should include specific industry or technical knowledge. Excellent teamwork skills especially with people less skilled in communication. Proven ability to influence cross-functional teams without formal authority. The ability to influence and work collaboratively with development teams is especially important. Many Product Owners have a bachelor level degree in the industry that their product serves or in development. Some also have additional business training. What you are most likely to hear a Product Owner say. Want to learn more about the Product Owner role?